Israel’s Batsheva dance company, the focus of vociferous pro-Palestinian boycott activity during the Edinburgh International Festival two months ago, continues to attract protest during a UK tour by its junior ensemble. Although its artistic director Ohad Naharin is a critic of Israeli policy towards Palestine, Batsheva is hailed by the current right-wing government as its “best global ambassador” and the company is financed by Israeli arms companies, the Israeli State, and the racist Jewish National Fund which works openly to dispossess Palestinians and replace them with Jewish immigrants. This is why the Don’t Dance with Israeli Apartheid campaign has mountedprotests at Batsheva Ensemble shows in Edinburgh, Manchester and Bradford, with more to come in Brighton, Birmingham, Leicester, London and Plymouth. There will also be protests in Italy later this week when the Batsheva Dance Company is due to perform in Rome. Every performance has met with lively demonstrations outside the theatres as well as short but effective interruptions inside. This is despite extravagant attempts by venue managers to weed out Palestine sympathizers, covertly aided – or more likely pressurised – by zealots of the StandWithUs pro Israel propaganda outfit. The latest protests occurred on Tuesday and Wednesday in Bradford where 100 or more Palestine sympathisers gathered outside the Alhambra theatre on each night. A member of the Green Party explained their involvement in the protests in eloquent detail. Demonstrators have written to the West Yorkshire police complaining of unnecessarily heavy-handed policing, but there have been no arrests. There has, however, been at least one assault on a peaceful protester by a pro-Israel audience member. Campaigners are considering bringing charges. Such is the level of Zionist exasperation at the growing support for the boycott movement, modeled on the campaigns which helped end apartheid in South Africa, they have resorted to bringing charges of “racially aggravated conduct” against protest organisers. These have been justly brushed aside by the authorities in Edinburgh but have surfaced again in Brighton where Batsheva is due to perform next week. This is clearly part of a campaign of intimidation against people of conscience trying to draw attention to Israel’s human rights abuses and violations of international law. Having no arguments to counter their critics, Israel’s apologists take refuge in smear tactics, ignoring the fact that throwing around the charge of antisemitism where it has no foundation devalues it and desensitises the public to genuine anti-Jewish racism when it arises. Norma Turner who helped organise protests at Manchester’s Lowry on November 2 and 3, said there had been many Jewish people among those on the protests there. 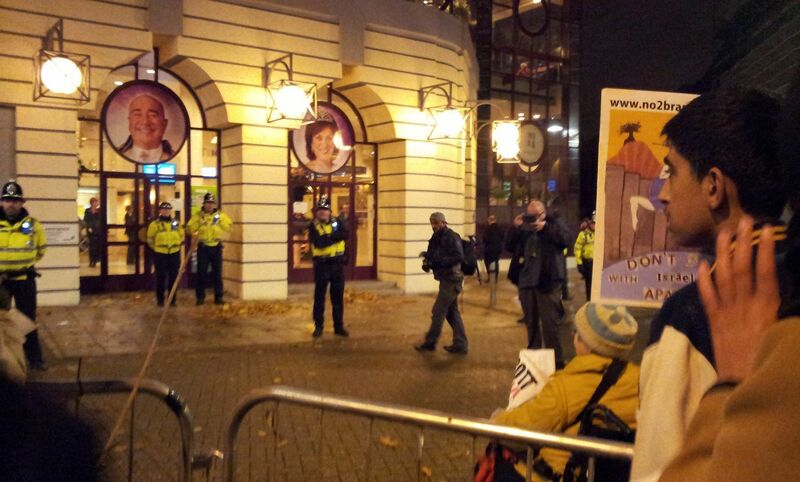 This had defused the usual “antisemite” slurs and facilitated a great deal of positive dialogue between campaigners and people entering the theatre. Attendance seemed to be low and discounts were on offer. “A number of ticket holders decided against attending the performance after hearing us explain about the cynical Brand Israel project,” said Turner. Brand Israel is a PR exercise started in 2005 by the Israeli Ministry of Foreign Affairs deliberately using culture as mask to beautify Israel’s crimes against the Palestinian people. The boycott divestment and sanctions (BDS) campaign is Palestinian’s non-violent response. 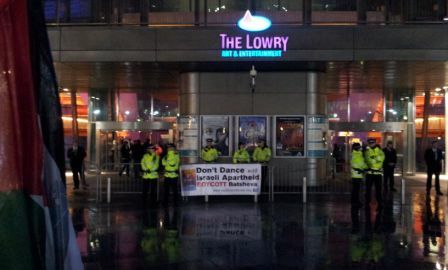 Activists have been accused of behaving like hooligans but this was clearly not the view of the Lowry management, who handed out hot drinks to protesters braving a rainy and windswept November night. This was despite the fact that managers had previously refused to engage with campaigners about Batsheva’s presence. In London too, where the Israeli ensemble is due to perform at Sadler’s Wells on November 19/20/21, the venue management has so far refused to engage with academics from the British Committee for the Universities of Palestine (BRICUP) who have requested a meeting. BRICUP has also issued a powerfulopen letter to Batsheva’s Naharin. Naharin has emailed the Don’t Dance campaign and been quoted arguing that boycott action is of no benefit to the Palestinian people. He said it was motivated by “frustration and revenge” whereas Batsheva aimed “to build not to destroy”. We need “to try and create a dialogue” to replace “conflict” in a hugely complex situation, he said. Mick Napier, chair of Scottish Palestine Solidarity Campaign, wrote in response “Far from ‘conflict’ impeding dialogue with protestors, it seems that only the fear of protests … induced Naharin to communicate in August, promising to discuss with his Board and get back to Don’t Dance with Israeli Apartheid. This budding ‘dialogue’, however, was still born, possibly because Batsheva hoped vainly that protests would fizzle out.” Napier said the Don’t Dance campaign has still not had a report-back from the Batsheva board. In recent correspondence with one campaigner, Naharin wrote sarcastically that people in the West Bank must be celebrating because someone shouted out during a quiet part in one of the Batsheva Ensemble performances. The truth is that yes indeed, they are. Palestinians are so desperate for the world to take note of the injustices they suffer that a voice calling out on their behalf in a dance theatre in Scotland is something to celebrate. Evidence of this can be seen in a YouTube clip from a group of young women in Gaza, not a slick, professional piece of Hasbara (propaganda), such as we are constantly fed by Israel’s foreign policy and media outlets, but a heartfelt statement of stifled Palestinian cultural expression contrasting bleakly with the freedom of Batsheva’s pampered dancers. We recognise and condemn the damage that Prevent’s “spot the potential terrorist” approach has made primarily in stigmatising and criminalising entire Muslim communities, but also to a growing number of political activists and campaigners labelled with ill-defined terms like “non-violent extremist” or “domestic extremist”. We view Prevent as a policy that is based on insufficient evidence to support the flawed assumption that 'extremist' ideology opposed to subjective 'British values' is the single most important cause of terrorism. We therefore support closer collaboration between different campaigning, religious and community organisations to call on the government to end its Prevent strategy. We support and encourage more political debate in schools, colleges and universities and reject attempts to close down and censor dissenting voices. We welcome open discussion with all young people about potentially radical ideas and call on all educational institutions to vigorously defend the right to free academic inquiry on issues considered 'controversial'. 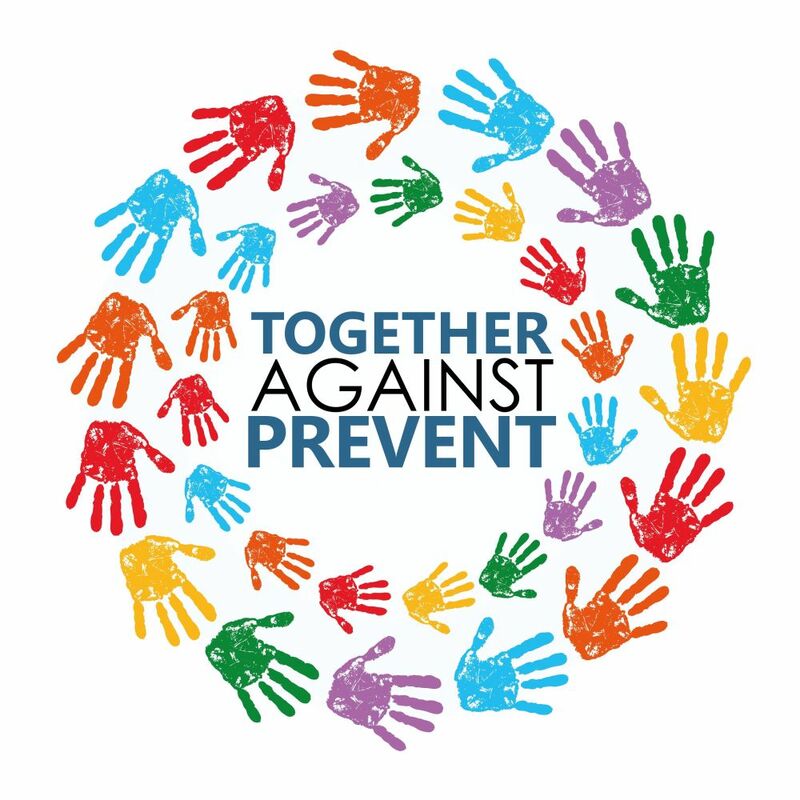 We pledge to take no Prevent funds and support non-cooperation, wherever possible, with local Prevent programmes. Copyright Boycott Israel Network. All Rights Reserved.